Substitute egg whites $1.79, Add ingredients to eggs: Meat $1.59, All other ingredients $1.29. 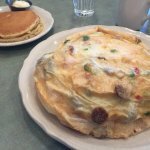 A combination of two large farm-fresh eggs, three fluffy buttermilk pancakes and your choice of meat (sausage patties, sausage links, turkey links, ham, Canadian bacon or bacon). A toasted, open-faced English muffin topped with spinach, sliced tomatoes and soft poached eggs. Finished off with our buttery hollandaise sauce and served with four golden brown potato pancakes. A toasted, open-faced English muffin topped with sausage patties, soft poached eggs and our house-made mushroom sherry sauce. Served with four golden brown potato pancakes. A favorite classic of a toasted, open-faced English muffin topped with Canadian bacon, soft poached eggs and our rich, buttery hollandaise sauce. Served with four golden brown potato pancakes. Three scrambled eggs mixed with diced, smoked ham and served with three fluffy buttermilk pancakes. A skillet filled with our house-made hash, made with corned beef, potato and onion. Topped with two, any-style eggs and served with three fluffy buttermilk pancakes. Two farm-fresh eggs served with four fluffy buttermilk pancakes. Two farm-fresh eggs served with two thick pieces of our signature Sourdough French Toast. Three crepes filled and topped with Montmorency cherries, poached in cherry syrup and tempered with Danish Cherry Kijafa wine. Dusted with powdered sugar. Three crepes filled and topped with sweet, fresh-cut strawberries. Dusted with powdered sugar and served with our house-made strawberry syrup. Three crepes filled with rich chocolate syrup and chocolate chips. Topped with fresh-cut strawberries and even more chocolate. Dusted with powdered sugar and chocolate chips. Two crepes filled with diced bananas and our sour cream mixture, flavored with cognac, sherry and Cointreau. Topped with sliced bananas and sweet apricot purée then dusted with powdered sugar. Three crepes filled with our rich Cointreau flavored sour cream and dusted with powdered sugar. Two crepes filled with our rich, Cointreau flavored sour cream, diced Granny Smith apples and toasted pecans. Topped with cinnamon sugar and even more pecans! Served with our house-made apple syrup. Served with vanilla ice cream upon request. This large bowl-shaped pancake has a soft custardy bottom and light airy sides. Dusted with powdered sugar right out of the oven. Served with a side of lemon slices, powdered sugar and a whipped butter blend for a sweet and tart treat. Six of our signature pancakes made from our fresh house-made batter. Six buttermilk pancakes filled with sweet plump blueberries. Dusted with powdered sugar and served with a side of our house-made blueberry compote. Six buttermilk pancakes filled with chocolate syrup and chocolate chip morsels. Topped with more chocolate chips and dusted with powdered sugar. Topped with whipped cream upon request. 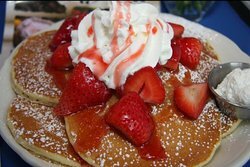 Six buttermilk pancakes covered with our fresh sliced strawberries. Dusted with powdered sugar and served with our house-made strawberry syrup. Topped with whipped cream upon request. Eight buttermilk pancakes filled with fresh chopped bananas. Topped with banana slices and dusted with powdered sugar. Served with our house-made tropical syrup. Freshly chopped crispy bacon mixed in our buttermilk batter. Six to an order. This 3-inch high pancake creation will satisfy any sweet tooth. Covered with sliced sautéed Granny Smith apples and a pure cinnamon sugar glaze. Six buttermilk pancakes filled and topped with toasted coconut. Dusted with powdered sugar and served with our house-made tropical syrup. Eight buttermilk pancakes filled with a sweet pumpkin purée. Dusted with powdered sugar. Covered in fresh sweet strawberries and dusted with powdered sugar. Served with our house-made strawberry syrup. Topped with whipped cream or ice cream upon request. Filled and topped with fresh plump blueberries and dusted with powdered sugar. Served with our house-made blueberry compote. Filled and covered with toasted coconut and dusted with powdered sugar. Served with our house-made tropical syrup. Filled and covered with toasted Georgian pecan pieces and dusted with powdered sugar. Covered with chocolate chip morsels and dusted with powdered sugar. Topped with whipped cream upon request. Filled and topped with crisp chopped bacon. Filled with diced Granny Smith apples and sprinkled with cinnamon sugar. Served with our house-made apple syrup. 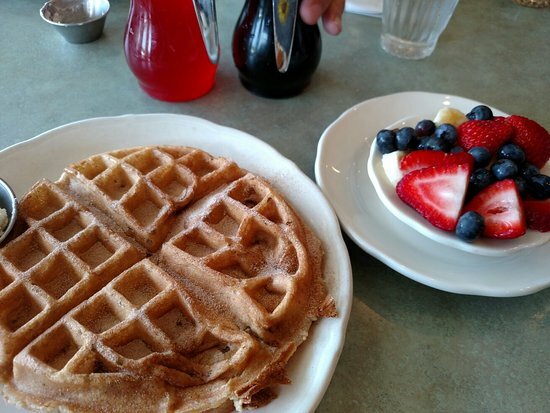 Our light, traditional batter cooked in our waffle irons until golden brown. Three pieces of thick Sourdough French toast grilled and topped with toasted almonds and sprinkled with cinnamon sugar. Three pieces of thick Sourdough French Toast grilled and topped with chopped toasted Georgian pecans and dusted with powdered sugar. Three thick pieces of sourdough bread hand-dipped in our rich egg batter and grilled to a golden brown. Dusted with powdered sugar. 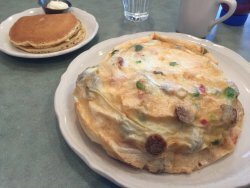 All omelettes are made with four large grade-AA, farm-fresh eggs and come with a side of three buttermilk pancakes (except the Vegetarian). Substitute egg whites. $1.79, Upgrade your pancakes. $1.59, Add ingredients to eggs: meat $1.59, all other $1.29. Our signature omelette filled with broccoli florets, fresh mushrooms, our western mix made with diced onions and red and green peppers and plenty of melted cheddar cheese. Served with a side of salsa and four golden brown potato pancakes. Filled with cheddar cheese and our signature, house-made corned beef hash. Filled with a mix of onions, red and green peppers and diced smoked ham. Filled with your choice of one meat: ground sausage, turkey sausage, ham or bacon and melted cheddar or Swiss cheese. Filled with fresh sliced mushrooms and served with a side of rich mushroom sherry sauce or salsa. Fresh spinach paired with baby Swiss or feta cheese. Filled with your choice of cheddar, baby Swiss or feta cheese. All options except Oatmeal and Cream of Wheat include choices of one: A side of wheat germ, buck wheat, gluten free pancakes, or a small banana bowl or three tomato slices. Three fluffy egg whites scrambled with our colorful western mix made with diced green and red peppers and onions. Served with a side of salsa. A four egg white omelette filled with turkey sausage, western mix made with diced green and red peppers and onions. Served with a side of salsa. Two fluffy scrambled egg whites and two turkey links. Our signature Eggs Florentine served on an open-faced toasted English muffin. 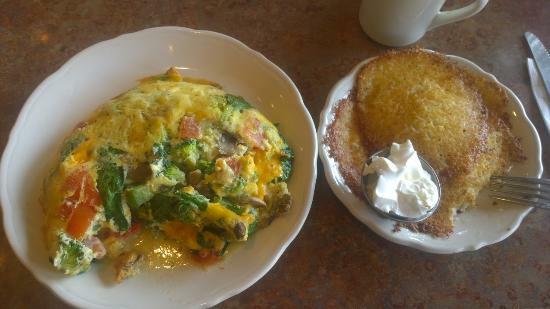 Topped with spinach, sliced tomato, one scrambled egg white and a sprinkle of Swiss cheese. Simple, hot and comforting. Served with 2% milk and light brown sugar. For our friends 10 years and younger. Three fluffy buttermilk pancakes with your choice of two pieces of sausage link or thick-sliced bacon. One fresh fruit crepe of your choice. One scrambled egg paired with three fluffy buttermilk pancakes. One scrambled egg, two buttermilk pancakes and your choice of one piece bacon or sausage link. One slice of our Sourdough French Toast with your choice of two pieces of sausage link or bacon. Any half order of your favorite, flavored pancakes. (Does not include: German Dutch Baby Pancake, Apple Pancake, Dave's Three Pigs in a Blanket, Swedish Pancakes or 49ers'). A mix of melted baby Swiss and cheddar cheese between two pieces of thick toasted sourdough bread. Served with a side of our cinnamon applesauce. All lunch entrées except Biscuits & Gravy are served with potato pancakes. Baby Swiss cheese melted on top of layered Hickory-smoked ham between two thick slices of grilled sourdough bread. Served with a melon slice. An open-faced sandwich with thick-sliced bacon, crisp lettuce and tomato on top of grilled sourdough bread. Served with a melon slice. One egg, any-style with melted cheddar cheese sandwiched between two pieces of thick, grilled sourdough bread. Served with a melon slice. A combination of melted Baby Swiss and cheddar cheese with sliced tomatoes on grilled sourdough bread. Served with a melon slice. Our house-made chicken salad with diced chicken in every bite. Served on a flaky split croissant. Served with a melon slice. Open-faced biscuits hot from the oven topped with creamy gravy made with fresh ground sausage and our own spice blend. Filled and topped with diced chicken breast, chopped black olives and red & green peppers mixed in our mushroom sherry sauce. Sprinkled with sliced toasted almonds. Filled and topped with shrimp, white fish, scallops and crabmeat mixed in our rich mushroom sherry sauce. Sprinkled with sliced toasted almonds. Filled and topped with fresh, crisp spinach and baby Swiss cheese mixed in our mushroom sherry sauce. Topped with sliced toasted almonds. A combination of sweet strawberries, plump blueberries and fresh bananas.